Everyone in information security knows nmap as the rightful king of the port scanners, and it still remains the most versatile option today. But for pure speed there have some that have surpassed it, including scanrand, unicornscan, zmap, and now masscan. Asynchronous transmission means the scanner doesn’t have to wait for replies before sending out probes. masscan was created for the sole purpose of scanning the entire internet as fast as possible, according to its author Robert Graham, this can be done in less than 6 minutes at around 10 million packets per second. In this short tutorial we’re going to learn the basics and provide some real-world examples. If you just need syntax to run with you can jump ahead to the Quickstart. 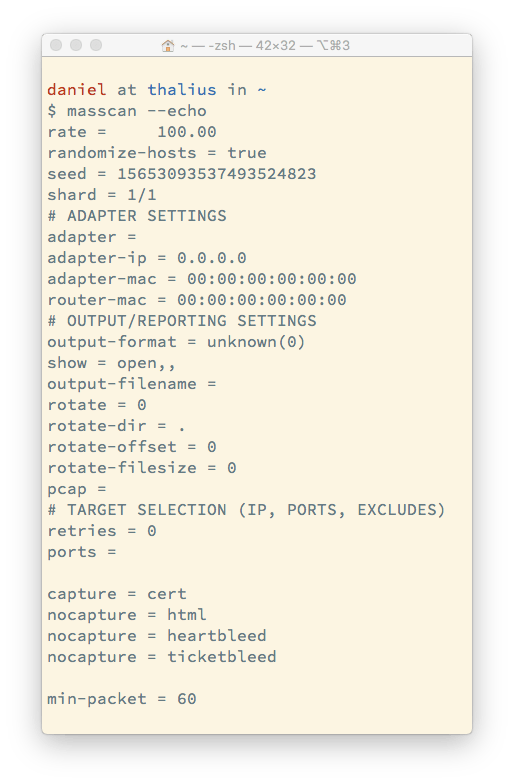 Installing masscan is fairly straightforward whether you’re using Linux or macOS. This will install the binary under bin/masscan; you’ll have to move it to run it from somewhere else. brew is the main command for Homebrew, which you can get here. Many people use masscan to scan very large networks (such as the internet) on one or just a few ports. 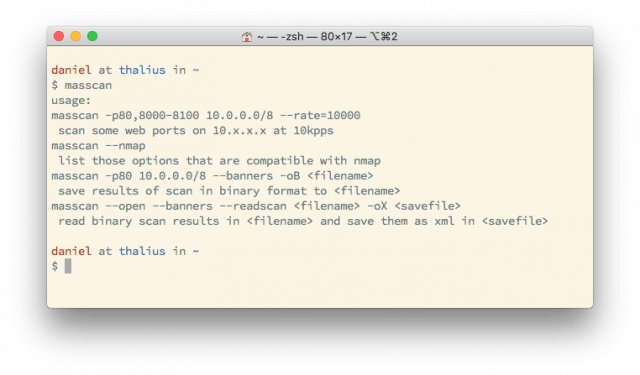 masscan has been designed to work much like nmap, which makes it instantly approachable for thousands of security professionals and enthusiasts. You can also scan multiple ports using a comma as a separator. By default masscan only takes IP addresses as parameters. This script by @jhaddix will let you scan a domain (translated to IP) instead. Or you can scan a range of ports using the dash. In addition you can use nmap’s ‐‐top-ports option, which lets you specify the top n number of the most common ports to scan. So if you give it ‐‐top-ports 100 it’ll scan the top 100 most common ports discovered according to nmap. If you don’t have the ‐‐top-ports option available to you, make sure you have the latest version of masscan. You can check masscan’s options with the ‐‐echo switch. Now that we’ve covered some basics, let’s look at some additional tweaks we can make. Using the settings above you’ll definitely get results, but the speed will be quite average. As discussed already, the whole point of masscan is to be quick, so let’s speed it up. By default, masscan scans at a rate of 100 packets per second, which is quite slow. To increase that, simply supply the ––rate option and specify a value. Scanning this fast (or even slower) is likely to cause all sorts of problems, including getting your system blocked on the internet, getting abuse complaints to your hosting provider, etc. Don’t just start scanning large networks without setting groundwork first. How fast you can scan is going to depend on a lot of factors, including your operating system (Linux scan scan far faster than Windows), the resources of your system, and—most importantly—your bandwidth. In order to scan very large networks at high speeds you’ll need to use rates of a million or more (––rate 1000000). Because much of the internet can react poorly to being scanned—and also just out of sheer courtesy—you may want or need to exclude some targets from your scans. To do this, provide the --excludefile switch along with the name of the file that includes lists of ranges to avoid. As we mentioned earlier, you can show the current masscan options using --echo, but you can also save them to a file using the standard method. -oX filename: Output to filename in XML. -oG filename: Output to filename in Grepable format. -oJ filename: Output to filename in JSON format. You can see the nmap-like functionality by passing the --nmap switch. -iL filename: Read inputs from a file. ‐‐exclude filename: Exclude a network on the command line. ‐‐excludefile: Exclude networks from a file. -vv interface: Very verbose output. -e interface: Use specified interface. Ok, here are some quick and functional scan examples that you can start with and then tweak to your taste and requirements. We’re assuming here that you want to scan quickly. We’ve increased the speed to 10 million per second, which will max you out. In general you should expect bad and/or amazing things to happen if you try this. There are other options available that you can get from following the readme.md for the source code repository, but this primer should get you up and running nicely. There are number of defaults that are enabled with masscan that need to be defined with nmap simply because the scanners work in different ways. For example, masscan always treats all hosts as online, scans are always randomized, it’s a SYN-based scan, it never does DNS resolution, and scans are performed using raw libpcap. One thing that’s fairly unique to masscan is that you can easily pause and resume scans. When you press ctrl-c a file is created called paused.conf that has all the settings and progress from the scan. You can resume that scan with ‐‐resume paused.conf.